There is a history in French cinema of fetishising American culture, appropriating their styles and iconography to their own ends, often doing it much better. This is most apparent in their adoption of the film noir genre as their own, as seen in the early films of the New Wave period, such as Breathless and Shoot The Piano, two noir-ish tales that put a Gallic slant on the gangster picture. In a summer that saw the anaemic Public Enemies, it only seems appropriate that a full-blooded gangster film should come from France, in the form of Jean-Francois Richet's 'Mesrine: Killer Instinct'. A loose biopic of Jacques Mesrine (Vincent Cassel), one of the most famous and notorious criminals of the post-war period, it follows Mesrine from his beginnings as a veteran of the struggles in Algeria who gets drawn into a life of petty crime, through his gradual indoctrination into the seedy underworld inhabited by the likes of Guido (Gerard Depardieu) and his eventual escape to Canada after he started robbing the wrong people. All of this takes place in just under two hours, making for a rather breathless experience. Killer Instinct deals with many of the same ideas and motifs as Public Enemies, but it handles them in a much more deft and interesting way. Much like John Dillinger, Jacques Mesrine is a man who commits crimes almost for the thrill of it, both achieve a level of notoriety, even celebrity from their crimes, and both have great difficulty deciding whether to continue with that life or to settle down and pursue a new course. Both also feature, amongst other things, bank robberies and prison breaks, but whilst Public Enemies revels in the complexities of them, Mesrine approaches them in a sublimely simple way. If you want to break out of prison, why not just wait until the guards are hungover and cut the wires in the fence in broad daylight? This simple audacity marks not only Mesrine as a character, but also Mesrine as a film. Richet's film manages to encompass a great many themes about France in the latter half of the 20th century. We are first introduced to Mesrine at the end of his life, as he is about to be gunned down by the French Secret Service, before the film takes us back to 1959, when Jacques is a soldier fighting against the rebels in Algeria. Already, we get a sense of France's shameful colonial past as Jacques is ordered to beat a man for answers, then is told to shoot the man's sister in order to get him to reveal the location of a bomb. Later on, when we are introduced to Guido, passing mention is made to Charles de Gaulle's 'Secret Army', suggesting that some of Guido's activities may have been sanctioned by the government, and the film is rife with references to the period and the confusion that existed in France in the early-50s and 60s. Killer Instinct meticulously recreates the style of the eras it inhabits without obsessing over. It may evoke the calm cool mystique of the time, and the films that defined that era, but it does not dwell on them or try to emulate them, instead being happy to let them serve as dressing to its own story. It would run the risk of being a mere indulgence in cool if it weren't for Mesrine himself, who is a fascinating character. Rife with inconsistencies and complexities, he's an all too human character. His relationship with women, in particular, often does a volte-face from tender and loving to ambivalent. Early in the film, we see Mesrine wreak bloody vengeance on a pimp who has badly disfigured a whore that Mesrine was seeing, displaying a distorted chivalry in his belief that a real man would not hit a woman. Later, however, when his wife Sofia (Elena Anaya) threatens to call the police to stop Jacques from going out and committing crimes, he beats her and shoves a gun in her mouth, revealing that he would always side with his friends if he had to make the choice between them and her, which contrasts sharply with early scenes in which he is shown to be a loving husband who is trying to go straight for the sake of his young family. He's also very charming and cool. He's the sort of man who, after robbing one bank, would agree to rob another right across the street since he would have just enough time before the cops arrived. The sort of man who, when interrupted in the middle of robbing a house by the owners, would pretend to be a police officer investigating the scene of the crime. He's a smooth operator, yet also a clearly terrible person that the film shows little interest in redeeming. This dichotomy would not be possible without Vincent Cassel in the lead role. Vincent Cassel absolutely dominates the film - as well he should, given the title - as Jacques Mesrine, displaying an ability to encapsulate two separate, opposing ideas at the same time. 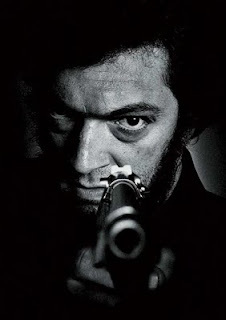 The script gives Mesrine his complexity and duality, but it is Cassel who is able to make him into a believable character, making Mesrine seem human, rather than a collection of anachronisms. It's difficult to judge Killer Instinct since it is only the first part of the story, with the second part, Public Enemy No. 1, due for release next month. The very nature of this style of storytelling prevents the film from having any real sense of resolution, though it does at least offer up a defining final moment, rather than just a cliff-hanger followed by ''to be continued''. However, as a singular entity is a fine film and I was left slavering for more.